Payworld, has come to rescue the several small businesses across semi-urban & rural areas of India through their Payworld mPOS ( Mobile Point of sale) . These mPOS are giving means to move the digital way by allowing merchants to accept Debit & Credit Cards in this present cash crunch scenario. The scenario where small retailers and wholesale traders are hit the most the deployment of these Payworld mPOS can give them a new lease of life by providing them a facility of accepting of payment from customers by swiping of their any bank debit/credit. Payworld associate with State Bank of India and HDFC bank to operate these mPOS. These mPOS machines also allow cash out upto Rs 2,000 as per RBI guidelines. The low cost strategy is compelling enough for retailers to deploy these mPOS machines. 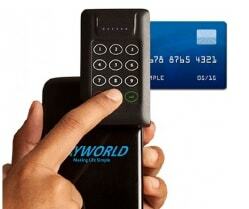 Payworld mPOS involve no extra space & heavy infrastructure for operating the facility. The retailer will use Payworld App in Smart Phone and connect the card reader device with the help of bluetooth . All he has to do is to swipe the walk in customer’s Debit/Credit card. According to Praveen Dhabhai,COO -Payworld, they are seeing a behavioral change in merchants and over the past few days, they have witnessed a sharp increase in demand for Payworld mPOS machines at small and medium merchant outlets specially in smaller cities. Payworld believes that they are hitting the right cord by deploying these mPOS machines which will give assurance to small retailers of not getting their business hampered during present cash crunch. Payworld mPOS – A boon for Small Merchants 1 out of 5 based on 1 ratings. 1 user reviews.